United States Brewers Foundation 1956 Ad. 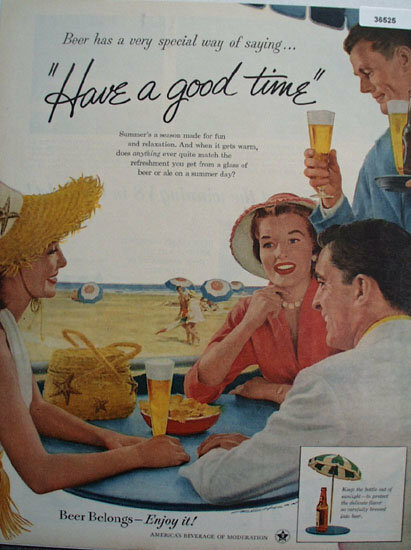 This color August 21, 1956 ad states Beer has a very special way of saying, Have a good time. Summers a season made for fun and relaxation. Beer belongs, Enjoy it. Picture shows two men and two women setting at table aat beach eating chips and drinking beer. Sandy beach is in background. Magazine tear sheet picture is taken through plastic and may show wrinkles or crookedness that is not in the ad. This Original magazine tear sheet measures 10 1/4 inches wide by 13 1/4 inches tall. Items Similar To "United States Brewers Foundation 1956 Ad"